10/1/2009 Fellwar Stone checks the effects of all mana-producing abilities of lands your opponents control, but it doesn’t check their costs. 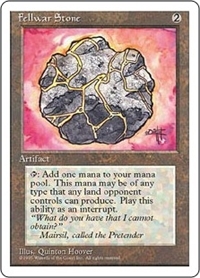 For example, Vivid Crag has the ability “, Remove a charge counter from Vivid Crag: Add one mana of any color.” If an opponent controls Vivid Crag and you control Fellwar Stone, you can tap Fellwar Stone for any color of mana. It doesn’t matter whether Vivid Crag has a charge counter on it, and it doesn’t matter whether it’s untapped.